Throughout history, technologies that have increased access to and the range of available information have fundamentally shifted the legal and moral structures that have governed societies. The invention of the printing press in 1517 allowed Martin Luther to expose the hypocrisy and injustices occurring within the church in regards to purchasing forgiveness, creating a split in the Catholic Church that radically changed European culture. Postal mail in the U.S. allowed small firms to coordinate at higher levels, giving rise to a new type of corporation. The telephone, and then the internet, gave rise to instant communications, empowering both mega-firms as well as the independent worker to reach and access more people for little to no cost. Today, children are born into a world with instantaneous communication on devices that provide the world’s information collection within seconds. Communication technologies are empowering new generations of people to share ideas and create new visions of what it means to be human. This change shows no sign of slowing so it’s time to begin the discussion of how we will adapt our legal and institutional structures to meet the needs of the rapidly changing generational consciousness, starting with the Constitution. If we’re going to create institutional reformation, the Constitution is an excellent place to start. In our previous related articles, we argued the injustice of binding future generations to the laws and structures of dead men as well as how we could implement Thomas Jefferson’s approach to revising the constitution today. But Jefferson wasn’t the only founder who had an opinion on the Constitution and how it should be regulated. James Madison was not in favor of Jefferson’s idea of redrafting the constitution every 19 years. Instead, he favored a more rigid structure that would only change when extremely necessary. I propose that both men were right and that a potential solution to deal with the growing ideological divides propelled by technology would be to have multiple constitutions. Before we explore the details of what this system might look like we should establish that there is no natural or legal law requiring us to abide by a singular rigid document. A significant challenge when reimagining the legal institutions of the United States is that much of the population shares a perplexingly dogmatic adherence to the laws and procedures of the distant past. 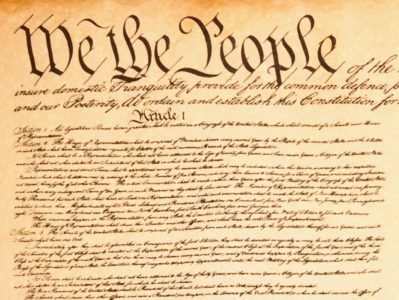 The Founding Fathers were brilliant men, but I believe that together we could create something even greater as a basis of our legal structure to better reflect modern society. One could argue for Constitutional rigidity in regards to fundamental human rights. We could determine these rights through referendum reviewing the existing Bill of Rights and imagining future rights that adapt to modern society such as health care, information, education, and transportation – all of which help to enhance the human experience and maximize the potential of the individual. Rigidity enshrined in legal precedent in this sense ensures that if a generation of peoples were to fall under the spell of a malicious actor that they could not impact the fundamental freedoms of those within the age who do not agree with their views. Generational constitutions create a more flexible set of institutional structures designed to change and adapt to the needs of society. The basic concept is that citizens within a generation would vote on the legislative and institutional arrangements that best support the maximizing of their generations’ potential. Operating under the current taxation system, we could limit them to resolutions legislation regarding access such as abortion rights, the right to safety and security, right to legal and recreational marijuana. If we can imagine innovations in taxation as well, we could go deeper into the structural control each generation would have over their destiny, allocating a certain percentage of funds to support projects they believe in while removing monies from projects they do not. In this scenario, it would also be essential to have a portion of each generations’ taxes go to collective social projects such as infrastructure updates and projects with other nations. This progressive project assumes a method of delivery that would provide easy and convenient access to the information necessary for the voters to make informed decisions about the mandates being voted on. Similar to the plan proposed in my previous article about revising the constitution there could be a multi-stage process involved in determining which proposals to consider. What problems do generational constitutions solve? Well for starters we know that there are significant ideological conflicts among generations when it comes to specific hot-button issues. For example, abortion shows an 18% increase in support among 18 to 29-year-olds when compared to 50 to 65-year-olds. Why then should the clear majority of the younger demographic that believes abortions fall under an individual’s freedom of choice be forced to comply with the moral beliefs of an aging demographic? Further supporting my argument, we observe a staggering difference between the religious affiliations of the people supporting the illegality of abortions in the U.S. This coincides with a consistent decrease in religious observation among youth in the U.S.,  which also happens to correlate with the increasing speed and usage of the internet in the U.S. . We’ve broken down a single issue, but additional examples indeed exist. How often should we have generations voting on their constitutions? Over the past 20 years, we have observed how radically technology can shift society and social norms. In 1998, we did not have smartphones, Wifi was not freely readily available, and solar energy was in its infancy. Today smartphones are used by over a quarter of the Earth’s total population , Wifi is available in all 50 states with the lowest percentage of coverage being 91.2% in Alaska , and solar energy is following an exponential growth trend of increasing output while simultaneously decreasing in cost. Considering these facts 20 years could be a good starting point, but I would propose a ten year period due to exponentially increasing trends in technology that are destined to create an even quicker pace of change in the not-so-distant future. Generational constitutions solve the problem of binding future generations to the dogmatic beliefs of the aging, allowing those generations to control their destiny and define their ways of living through a democratic consensus. We also need not limit this thinking to ages, it could also be a tool for minorities to gain more access to the education and opportunity to further their destinies. This type of legal reformation is vital to reimagining the U.S. democracies as it provides a method of empowerment for generations of the future who are voiceless to offer perspective. Best of all, this type of progressive project revitalizes and empowers the core value that Americans hold so firmly, the commitment to a government run by the people for the people.